How organisations distribute their board packs has evolved over time. Whilst digital alternatives have begun to take hold, many organisations continue to use paper or PDF documents. The continued use of paper has dogged many organisations with issues that not only add to the stress of the board meetings, but also reduce the focus of such meetings. Late submissions, unfinished board papers and trawling through reams of paper show that paper, or even PDF’s, are no longer effective when disseminating company information for board meetings. Research by The Institute of Chartered Secretaries and Administrators (ICSA) in February 2018 further supports this, finding there was widespread dissatisfaction with both the quantity and quality of information on show in board packs. It was felt they were either too long or they were not focused on the issues or information that really mattered. Further research conducted by eShare in 2016 shows how much work goes into preparing these board packs. The research found that the average board pack size is 97 pages, which then needs to be distributed to each board member, and with the average board containing 8 members who meet 8 times a year on average, that equates to around 6200 pages per year. This is just an average, and actually more recent studies have found the size of board packs are still increasing in size meaning many companies will be producing larger board packs and meeting more frequently, which puts into perspective the task at hand for those preparing the meetings. Earlier in August, we attended the CSSA Conference, hosted at the Montecasino Complex in Johannesburg, where we met with company secretaries from Africa to discuss emerging technologies, a topic that is always high on the agenda. We had some great conversations at the stand about how organisations are dealing with the rise in technology, as increased technology use becomes more and more prevalent in the region. With more and more organisations electing to use technology for everyday tasks, we took the time during these conversations to discuss how eShare are able to help begin, or even continue, the transition over to using digital technology. We discussed how organisations can begin by moving their board meetings over to a digital format, showcasing our online board portal, which is designed to improve the management of all tasks surrounding your board, including the streamlining of governance. Introducing technology at the top of an organisation helps to create a culture of technology adoption, something that inevitably trickles down throughout the organisation. While we were keen to show that paper over time has lost its effectiveness when compared to its digital counterparts, we were more interested in showing how technology can unlock so many potential opportunities. Rather than organisations drowning in a world of paper and printing costs, digital technologies can give you focus and control over your organisation and its direction with ease, giving you time to spend growing other areas of the business. With this in mind, it’s easy to see why there has been a significant rise in organisations conducting their meetings using digital solutions, none more so than in South Africa and its surrounding countries. This is down to not only the lack of effectiveness of paper, but the region’s mobile first attitude, something that has become a deciding factor for many businesses procuring technology solutions in recent years. Reduced technology prices and more entry level smartphones becoming available have seen more mobile devices being used than ever, so much so that in a report by Effective Measure in March 2018, 71.47% of page views came from a mobile device. The conference also hosted several thought provoking sessions with a variety of thought leaders, who discussed governance, the King IV Report, board evaluations and tips for company secretaries. However, one talk stood out in particular, hosted by Andrej Vladar, Managing Director – Africa at LUMI, which discussed the rise in electronic meetings. Andrej spoke about the challenges facing organisations who are looking to digitalise their meetings, something we found to be very similar to those in any other region; the fear of cost, scepticism of technology or plainly it wasn’t known about. However, if there is a region that would benefit most from digital transformation, it is Africa. Andrej highlighted the benefits that can be achieved through digital technology, the security, the ability to run hybrid meetings and still all have access to the material. He further supported the positive impact that technology can have by discussing how electronic meetings provide opportunities for real time voting, as well as clearer reporting which reduces the stress when your organisation is audited. 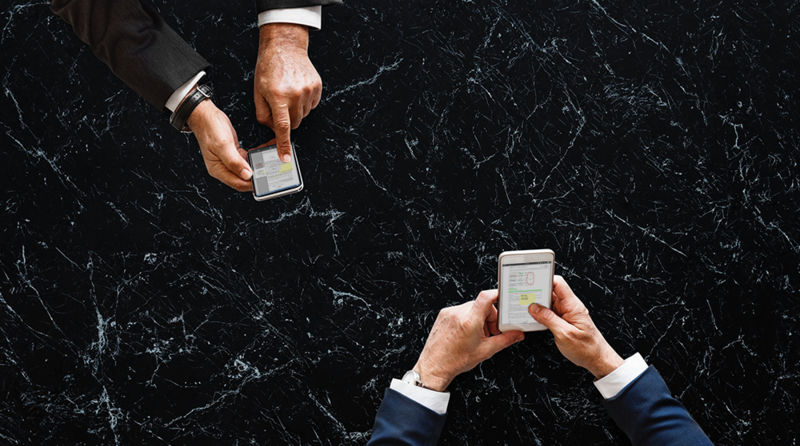 Moving from paper to electronic meetings really puts the power and control back in your hands, hence why we were so keen to speak to people about the power of mobile technology. As most people will know, mobile gives you instantaneous access to material on the go, and with more solutions offering high level security, using a mobile device is not only far more portable but has become safer in the process. Mobile technology also gives you the ability to update documents and in an instant, share them to whoever you wish without having to send to distant locations and dealing with the associated time and costs that would inevitably come. In addition to this, there is a chance that your material might not be delivered, or get lost, which puts your organisation’s sensitive information at risk. Security therefore is vital for organisations who use board portals, as users have access to sensitive information that will not want to be shared. Having said that, the ability to access this material on the go is the reason why digital technologies have become so popular, especially for board members who are able to review necessary documents in preparation for their board meeting. The mobile first era we are seeing in South Africa offers a great deal of opportunities, however, with the sheer amount of information available on a daily basis, your average person can find themselves drowning in a world of data. For this very reason, choosing the right technology solution is key, as you need one that is designed to focus the information in front of you, it needs to be succinct as the end user—you—does not want to be scrolling and scrolling to find what they need. Our BoardPacks solution does exactly this, starting with the ability to create a simple agenda that works for your organisation right through to facilitating robust discussions, ensuring everybody is on the same page. Features such as our shared annotations, ability to bookmark pages for quick access, presenter mode and search functions—allowing you to search both past and present papers and minutes—help to improve collaboration in the meeting, but also keep the board meeting focused and driven towards an outcome. BoardPacks offers an intuitive solution built around reducing the stress surrounding board packs and meetings. The conference was a fantastic experience across the two days, and enabled us to catch up with some familiar faces as well as demonstrate to new attendees the latest features we have been working on. If you would like more information on how BoardPacks can improve the operations surrounding your meetings, please do get in touch. Daniel Morris posted on 31/08/18 - 10:08 am & filed under Events.